match-wining five-wicket haul in the first one-day against England here proved that he had been bowling well in recent matches without getting just rewards. As the performance graph of opening batsman Virender Sehwag goes down with each match, the clamour to drop him from the team is going up in equal measure. London: Sachin Tendulkar was effectively ruled out of the forthcoming tour of the West Indies after he was declared unlikely to be fit to play “up to two to three months” following a keyhole shoulder surgery here. Sri Lanka seized control of the first Test against Pakistan after a career-best bowling performance from Farveez Maharoof was followed by a powerful top-order batting display today. Pakistan grabbed the initiative yesterday after bowling out Sri Lanka for 185 but the hosts struck back on day three, skittling out Pakistan for 176 in 54.4 overs and then responding strongly to finish on 242 for two. Sri Lanka’s Kumar Sangakkara plays a shot during the third day of the first Test between Sri Lanka and Pakistan in Colombo on Tuesday. Shane Warne grabbed six wickets to spearhead Australia to an unbeatable 2-0 series victory over South Africa on Tuesday. Despite stiff resistance shown by the South Africans for most of the final day of the second test, the Australians surged to victory by 112 runs after leg-spinner Warne claimed six for 86. After shooting to glory at the Commonwealth Games, Samresh Jung started his campaign in the ISSF World Cup in Guangzhou, China, on a disappointing note finishing 34th in 50 free Pistol event. Sundernagar: Soon after shooter Vijay Kumar won the first of his two gold medals at the Melbourne Commonwealth Games, his father Banku Ram got busy attending congratulatory calls at the Sub Post Office at Harsaur village in Hamirpur. The reason: there was no telephone at home. When Vijay won his second gold, his family finally purchased a cellphone. Vijay’s brother is now sharing his father’s “burden” by answering hundreds of calls coming in from all directions. The saga of losing coaches in Indian hockey seems set for another twist with the Indian Hockey Federation seriously contemplating ‘sacking’ Rajinder Singh (Jr) who had taken charge in May last year. Even as the Indian performance at various multi-discipline sporting events seems to be improving gradually, the allowance and other facilities provided to the athletes are heading in the opposite direction. Tainted weightlifter Edwin Raju and team-mate Zakir Asadullah were grilled for six hours by a three-member inquiry panel of officers from the city-based Army Sports Institute over the last two days to establish facts pertaining to doping charges at the 18th Commonwealth Games held in Melbourne recently. Off-spinner Harbhajan Singh today said that the match-wining five-wicket haul in the first one-day against England here proved that he had been bowling well in recent matches without getting just rewards. “I was confident that there was nothing wrong in my bowling and today’s performance vindicated that,” Harbhajan said after the match. “It is a great feeling to be among the wickets again and I would like to thank the team, coach and all the players who stood by me and believed in my ability,” the Punjab bowler said. Describing the track as a “typical Kotla pitch”, the off-spinner said it became slower and lower as the match progressed. “But you got to bowl well to get wickets and Yuvraj gave me brilliant support,” Harbhajan said, adding that the wickets of Andrew Flintoff and Kevin Pietersen in successive overs turned the match in India’s favour. Skipper Rahul Dravid admitted that he was not very confident of victory at the half-way stage but the bowlers rose to the occasion. “Bringing Yuvraj and Harbhajan together was the last throw of dice and it worked,” Dravid, who was not too happy with the team’s batting display, said. A visibly dejected Flintoff said that 240 was a par score on the wicket which did not deteriorate in the second half of the match. The Delhi player, who has been short of runs, particularly in the one-dayers, was once again got out early today to an irresponsible shot for seven off eight balls. This left his die-hard fans, including some former cricketers, at the Ferozeshah Kotla here disillusioned. “He should be given one more chance and if he fails to deliver again, he must be dropped,” said a former cricketer. “Sometimes such jolts are necessary. It helps a player to rediscover his hunger,” he told PTI on condition of anonymity. For the record, the 27-year-old ‘Nawab of Najafgarh’ has not scored a century in his last 25 one-day innings. He has totalled 757 runs at 31.54 with three half-centuries to his credit. The reaction of the fans to Sehwag’s continued failures was more bare. “He has had his chances, it is very obvious that bowlers have sorted him out,” said Mukesh Kumar, an IIT Delhi student. “In Pakistan he was able to score on flat tracks but the moment the ball started to do a bit in Karachi, his weakness was exposed. It was the same against England in Mohali too. If he can’t score on home tracks, then it is time to give him rest so that he can reorganise his batting,” said the 24-year-old with India colours painted on his face. However, a respected cricket writer said India should not take any decision in haste as it could have telling effects on the side’s overall performance. 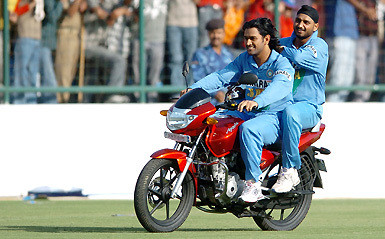 “Before we decide to drop Sehwag, we must keep in mind that we do not have Tendulkar. Keeping Sehwag out would mean we will lose both the openers. Even without Tendulkar’s problem, the Indian team relies on Sehwag for explosive starts. So if he is not there it will leave a gaping hole at the top. Also, we must remember that he is still our best batsman when the ball is turning,” he said. Fitness worries have also added to the woes of Sehwag, who was most recently troubled by back spasm in the Mumbai Test which India lost by a whopping 212 runs. For some fans, the team management and selectors must apply the same yardstick for everyone if performance is the only criteria for picking a player in the national side. Sri Lanka seized control of the first Test against Pakistan after a career-best bowling performance from Farveez Maharoof was followed by a powerful top-order batting display today. Pakistan grabbed the initiative yesterday after bowling out Sri Lanka for 185 but the hosts struck back on day three, skittling out Pakistan for 176 in 54.4 overs and then responding strongly to finish on 242 for two. By close, Sri Lanka’s lead was already a potentially match-winning 251 with Kumar Sangakkara (77) and Mahela Jayawardene (69) still at the crease. Maharoof sparked Sri Lanka’s revival in the morning, claiming the wickets of Inzamam-ul-Haq (31) and Abdul Razzaq (8) in the first half hour to finish with career-best figures of four for 52 from 15 overs. Maharoof was supported by off spinner Muttiah Muralitharan who polished off the lower order during an unbroken two-hour spell, taking three for 41 from 17.4 overs. Opener Upul Tharanga then consolidated Sri Lanka’s initiative with a fine 72 from 133 balls, adding 53 with Sanath Jayasuriya (13) and another 74 with Sangakkara during a long hot afternoon. Sri Lanka’s openers closed the first session on 37 without loss. When Tharanga was brilliantly caught at mid-on after a mistimed drive, Jayawardene maintained the momentum with a glorious half century that included 10 fours and a six. Sangakkara continued to graft hard for his runs, refusing to take unnecessary risks during a four-hour stay at the crease, while Jayawardene raised the tempo during an unbroken 115-run third wicket stand. Fall of wickets: 1-25, 2-25, 3-28, 4-122, 5-127, 6-138, 7-154, 8-160, 9-172, 10-176. Bowling: Malinga 12-3-30-3, Maharoof 15-2-52-4, Fernando 3-0-20-0, Bandara 7-1-32-0, Muralitharan 17.4-4-4 -3. Fall of wickets: 1-53, 2-127. Shane Warne grabbed six wickets to spearhead Australia to an unbeatable 2-0 series victory over South Africa on Tuesday. Despite stiff resistance shown by the South Africans for most of the final day of the second test, the Australians surged to victory by 112 runs after leg-spinner Warne claimed six for 86. It was his 35th five-wicket haul in Tests. The visitors won the first match in the three-test series by seven wickets in Cape Town. The final test starts in Johannesburg on Friday. South Africa, who were set a target of 410, were dismissed for 297 with 6.1 overs left in the match. Boucher fought hard for his unbeaten 51. Warne, who began his first spell unchanged from the 16th over before lunch until an hour after tea, bowled to a field that at times featured a silly mid-off, silly point, two slips, a leg slip and a forward short leg. Fall of wickets: 1-91, 2-98, 3-122, 4-122, 5-146, 6-170, 7-181, 8-253, 9-292, 10-297. Jung had a qualifying series of 93, 85,89, 95, 90, 96, taking his total to 548, which put him out of contention for the final series. Korean Oh jong Jin won the gold with a total of 662.6 (569+93.6). Portuguese Joao Costa (568+94.6) had the same score but had to be satisfied with the silver because of a lower qualifying score. Spaniard Isidro Lorenzo won the bronze with a total of 661.9 (567+94.9). The Indian, who clinched five gold, two silver and one bronze in the Commonwealth Games, had finished 20th in the qualifying round yesterday after shooting a score of 557 with a series of 95, 93, 89, 92, 96, 92. Compatriot Vivek Singh had finished 48th in the same event. He shot a score of 538 with a series of 96, 89, 91, 87, 90, 85. Meanwhile, the women were no better and could not repeat their success in Melbourne. Shooters from China and other non-Commonwealth nations dominated the 10m Air Rifle event as Indian women failed to secure any medal. Tejaswini Sawant, Commonwealth Games gold medalist in the 10m Air Rifle event, finished 10th with a score of 395. Avneet Kaur Sidhu, who lost the gold to Tejaswini in Melbourne was the next to follow with 393 at 16th. Anjali Bhagwat, with a series of 100, 99, 96, 99, finished six rungs below her at 19th. Chinese Yinghui Zhao, who shot a score of 503.5 (399+104.5), won the gold. Compatriot Li Du, tied with Zhao after the qualifying series, grabbed the silver with 500.7 (399+101.7). Sundernagar: Soon after shooter Vijay Kumar won the first of his two gold medals at the Melbourne Commonwealth Games, his father Banku Ram got busy attending congratulatory calls at the Sub Post Office at Harsaur village in Hamirpur. The reason: there was no telephone at home. When Vijay won his second gold, his family finally purchased a cellphone. Vijay’s brother is now sharing his father’s “burden” by answering hundreds of calls coming in from all directions. Elated at his son’s success, Banku Ram, a retired Subedar from the 4th Dogra Regiment, wants his son to win a gold medal at the Olympics. Born on August 19, 1985, Vijay was selected in the 16th Dogra Regiment about four years ago when he was student of Class XII. During training, he was found to be good in shooting and encouraged by the instructor to pursue the sport. Since than he has won about 40 medals in various competitions. At present Vijay is posted at the Infantry Training Centre in Mhow (Madhya Pradesh). “He has not been able to visit us for the past eight months,” says Banku Ram. “He is now in China for the World Cup”. Thanks to Vijay’s exploits, Harsaur village, about 6 km from Badsar subdivision of Hamirpur, has risen from obscurity to prominence. The village is bearing a festive look these days and guests are pouring in to become part of the celebrations. The saga of losing coaches in Indian hockey seems set for another twist with the Indian Hockey Federation (IHF) seriously contemplating ‘sacking’ Rajinder Singh (Jr) who had taken charge in May last year. IHF Secretary K Jyothikumaran, who returned here from Commonwealth Games a disappointed man with another dismal performance by the senior hockey team, indicated that Rajinder could be shown the doors. “This appears inevitable now,” he told UNI when contacted today. He said by April 1, a meeting to review the situation would be held and a final decision taken on finding another new coach. However, he ruled out the IHF going in for a foreign coach right now. “We have to find somebody here itself,” he added. The athletes received only $ 20 per day each at the Melbourne Commonwealth Games that made making two ends meet pretty difficult. The situation seems all the more galling as the athletes received $ 35 at the 2002 Manchester Commonwealth Games and $ 50 at the Athens Olympics. One of the senior functionaries of the Indian Olympic Association said the decision to reduce the daily allowance was taken by the Union Sports Ministry and the IOA had no role in it. Tainted weightlifter Edwin Raju and team-mate Zakir Asadullah were grilled for six hours by a three-member inquiry panel of officers from the city-based Army Sports Institute (ASI) over the last two days to establish facts pertaining to doping charges at the 18th Commonwealth Games held in Melbourne recently. Raju and Tejinder Singh had tested positive for the banned anabolic steroid, bringing disrepute to the country. The three-member inquiry panel comprises Lieut-Col K.S. Gehlot, Lieut-Col R.K. Nayak and Major Prabhu Dayal. Raju of Bombay Engineer Group (BEG) and Centre, Khadki, had returned to his unit on Saturday. Coaching Centre Chandigarh XI won the Shaheed Bhagat Singh football tournament here yesterday. The tournament, held at War Heroes Memorial Stadium, was organised by the Vikas Parishad. The CCC XI beat the Union Club Ambala in a tie-breaker 3-2. The chief guest, Past Rotary District governor Y.P. Das, presented the trophy and Rs 21,000 to the winners. Runners-up team received Rs 15,000. Former Ambala Cantt MLA and Vikas Parishad chairman Anil Vij was also present on the occasion. Gopal Thapa of the CCC XI was declared the best sportsman. Sandeep of Yamuna Nagar the best goalkeeper while Rahul Puri of the Union Club was declared the best scorer. A number of former football players were also honoured on the occasion. These included Vishwa Prakash Walia, Om Prakash Sharma, Sagar Singh, Bhupinder Singh, Mahendra Arora, Tilak Raj, Ramesh Sharma, Rajpal Singh, Pawan Kumar, Chotey Lal, Kuldeep Jain, Ramu and Sumit Prakash.